(EBC) Everest Base Camp Trek is the most popular treks in Nepal, tinged with the sentiment of being so near to the most astounding mountain on the planet. From the little runway of Lukla, the trail leads through Sherpa towns, woodlands of fir and rhododendron and cross-way over the high suspension bridge to meet caravans of zobkyo (a yak-dairy animal crossbreed) along the way. On the way to base camp, Namche Bazaar is a beautiful, bustling business sector with merchants from encompassing towns and to the extent Tibet. And from Tengboche the views of Mt Everest (Mount Sagarmatha), Lhotse, Nuptse and Ama Dablam are exciting. Moving over the tree line to cross elevated fields and icy moraine you, in the long run, achieve base camp, high on the Khumbu Glacier. Vivid expedition tents give an unusual appearance to this desolate spot encompassed by rock, snow, and ice. 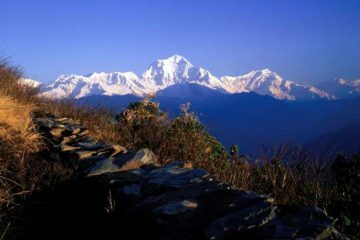 Day 09: Trek to Gorakshep (5150m, 5 hours) and Hike to Mt. Everest Base Camp (5364m) then back to Gorakshep. Views of Island Peak, Lhotse, Ama Dablam and the fluted ice wall of Amphu Lapcha. Incredible mountain flight in and out of Lukla. Staying in mountain tea houses. Mount Everest from Namche Bazaar. Views from Mt. Everest Base Camp and Kala Patthar. Attractive rhododendron and pine jungles, multiple ethnic settlements. Valleys with the awesome perspective of the mountain ranges and covering views. 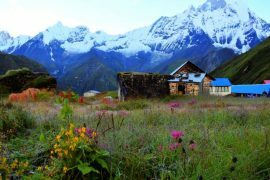 Explore Sherpa villages along with the medieval Thame and Tengboche monasteries. The landscapes of Khumbu glacier and icefall surrounded by Sagarmatha National Park. A closer look into the lifestyle of globally famous climbers – the Sherpas. 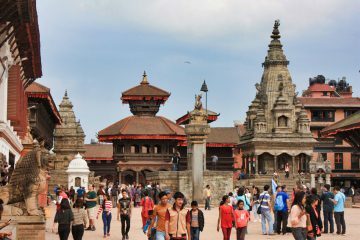 After your arrival at Kathmandu International airport, you will be transferred to the Hotel. In the Hotel, offer you comfortable welcome drinks. In the late afternoon, your trekking guide will come for a pre-trek briefing about the preparations. For an e.g. ; Time, details & trek preparation. Everest Base Camp Trek - Fly to Lukla (2800 m, 30 min) and hike to Phakding (2600 m, 3 hours). 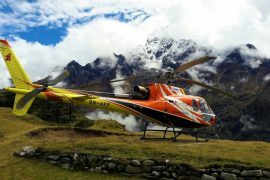 You will be transferred to the air terminal for a short grand flight to the Tenzing-Hillary Airport at Lukla. Where you begin your trek. The mountain flight into Lukla is tremendous and the finding an energizing. Afterward, you will head towards Phakding with perfect scenery view by passing suspension bridge, Chorten, Mani stone and prayer flag with beautiful mountains like Karyolung (6511 m), Nupla (5885 m) and Gongla (5813 m). In the middle place, you will stop to take a tea break. After a drink break, you just walk for 1 hr to Phakding. As you arrive at the Lodge, in the late afternoon, go to visit nearby attraction of place by following Dudh Koshi River. Cross the suspension bridge and hike for 40 min to the Pema Choling Gompa, which has a 350 years Old history and most important Gomba in Khumbu. Everest Base Camp Trek – Phakding to Namche Bazaar (3440 m, 5 - 6 hours). On this third day, trail condition in beginning is a comfort and at last two and half hours will be difficult which mean going all the way upwards up to Namche Bazaar. Till Namche, you cross four suspension bridges, which give you an amazing swing experience. Now, after the early morning breakfast, you will walk gradually and cross suspension bridge by following crystal blue white water river Dudh Koshi. Afterward, you pass through narrow trail along with wide stone trail beside suspension bridges up to Chumoa, where you stop to show the TIMS cards. Continue your way, move further by rounding clockwise to many chorten and mane stones with the view of greenhouse and Mountain View like Mt. Kongde (6168 m), Mt. Thamserku (6608 m) and Kusum Kangaru (6367 m) then reach Monjo. A last village before the Sagarmatha National Park. After showing National Park permit the trail leads few up and down and reach Jorsalle. 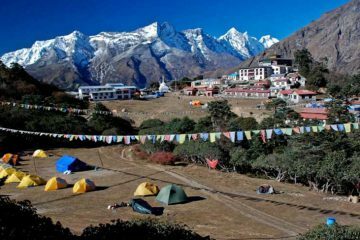 Then, last two and half hours upwards by crossing Hillary Bridge and by viewing Mount Everest, Mount Lhotse and Nuptse from tope Danda, you reached Namche Bazaar. A bustling mountain town. The heart of Khumbu, which was built in an ancient valley is the largest of all Sherpa settlement. This is a place where you stop for rest tonight and for acclimatization as well. Everest Base Camp Trek - Acclimatization day in Namche Bazaar. On your acclimatization day, you will hike 440 m Uphill Mountain from the sea level in order to acclimatize your body before going higher elevation next day. After your breakfast, you head upwards through stone steps for few minutes and gradually a steep hill for total two hours. Finally, you reach to Syangbuche, a top hill on the elevation of 3880 m from the sea level. As you accomplished to the top hill, Himalayas gave a 360-degree contrasting view. Khumbila (5761 m), Cholache (6440 m), Tawache (6542 m), Nuptse (7864 m), Mt. Everest (8848 m), Lhotse (8516 m), Amadablam (6812 m), Kangtega (6779 m), Thamserku (6608 m), Kusum Kangaru (6367 m) and Kongde (6168 m) are some of the famous mountains that you could see from atop hill. Spend one hour there by taking the picture. 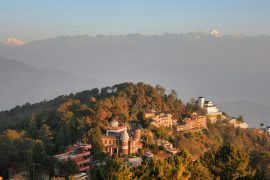 After that, descend to lodge and go to see the market of Namchebazar in the late afternoon. Everest Base Camp Trek – Namche Bazaar to Tengboche (3860 m, 5 hours). After breakfast, you will start your trek through narrow trail by passing stupa with an outstanding view of Mt. Amadablam, Mt. Everest, Mt. Tabuche (6367 m), Mt. Thamserku etc. And even on your continuing way, you see a beautiful village called Phortse, where ice climbing training is organized and it is also said that each houses person is able to climb High Mountains. Then after, few minutes you walk into rhododendron forested area and conifer trees. Fortunately, if you are lucky you see a mountain goat, a Himalayan tahr gazing on the middle of slope on high rocky mountain hill on the right side. Subsequently, you descend through rhododendron forest and pine tree at the end before cross suspension bridge and reach Phunki Tenga beside the Dudh Koshi River. Lastly, you trek for two hours all the way upwards direction passes by the pine tree and incent conifer trees up to Tengboche. Where you stop to rest for the night. From there Spectacular Mountain View of Mt. Everest, Mt. Amadablam, Mt. Lhotse and really, the Mt. Thamserku is so close, feel like touching. After one hour freshens up, go to visit nearby Tengboche Monastery which was established in 1915 AD. Tengboche Gompa, the cultural and religious center of Khumbu, it has been destroyed and rebuilt twice as the result of earthquake and fire. Everest Base Camp Trek – Tengboche to Dingboche (4400 m, 5 hours). On this 6th day, the trail is quite easy to compare other days. But you cross the tree line and should reach above 4000 m from the sea level. Similarly, you will go on high height place and take a rest for acclimatization next day. Because of no tree line, there would be a lot of chances of windy on the way. So, you must already have prepared to keep warm your body. After morning breakfast, you descend smoothly by walking through rhododendron forest and followed Dudh Koshi River. Cross an iron bridge and headed upwards with Mani stone and conifer for 45 min up to the lower Pangboche. The real last village. After that, you slowly cross the tree line and move forwards by viewing high height mountains and animals; yak and nak on ridge path before reaching Dingboche. Where you stay for a night and for acclimatization day. Dingboche used to be a summer settlement for yak grazing. You might see some yak and nak grazing over a slope of the cliff. Mountains such as Lhotse, Imjatse, Amadablam, and Taboche were amazingly skyline which is beyond the expectation. Everest Base Camp Trek - Acclimatization Day Explore the Chukung Valley. Again, have your breakfast and order for lunch. After that just headed 300 m up at Chukung height (4735 m). The height is a very popular destination for acclimatization and also a gateway to the very popular Island Peak. 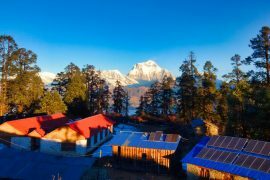 From this hilltop, you see a striking view of Amadablam, Lhotse, Nuptse, Tabuche, Peak 38 (7590 m), Thamserku, Island peak (6189 m), Baruntse (7152 m), Amphula (5630), and Makalu (8485 m) etc. Even you see very beautiful birds like Himalayan crow also called Himalayan Ravan, Common Kestrel, Himalayan vulture etc. Animals Nak and yak are grazings that make you feel like how they can survive on the mountain above 4000 m in this cold region. After spending half an hour on the Chukung height, came back followed by the same trail and have a lunch. Spend your rest of the time by sitting in the sun and listen to music, drink hot water and tea as well as move around to enjoying a view. Everest Base Camp Trek – Dingboche to Lobuche (4900 m, 5 hours). 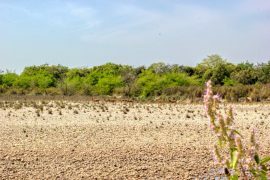 On the Eighth day, a trail led through little upwards like half an hour through stupa and smoothly walk into grassland where no trees area. After walking slowly but surely, you touch at Thukla. Continue uphill for one hr which is difficult section. As you cross the toughest part, you met a lot of memorials chorten built in the memorandum who were summited the Mt. Everest and other mountains lie in the Everest Base Camp Trek region. For example; Babu Chiri Sherpa from Solukhumbu, at very young age of 13 he started his career as a climber. By the age of 36, he summits Everest 10 times. But, on 29th of April 2001, when he tried for the 11th time he left this world. Another person, Hristo Prodanov who is from Bulgaria who scaled Mount Everest alone without oxygen on 20th of April 1984. But, died on his way back from a summit on the same day. Likewise, there is a number of them who summited Everest and left their life. After passing memorials part you again walked for around more than 1 hrs bit by bit and arrived at Lobuche. In the late afternoon before sunset, go to see Khumbu glacier from 100 m uphill. Everest Base Camp Trek - Lobuche to Gorakshep (5150 m, 5 hours) and Hike to EBC (5364 m) then back to Gorakshep. On the ninth day of today is a final day of accomplishing the Everest Base Camp. Which will make you feel proud to be excited near to the top of the world. Actually, the trail is smoothly up and down. Comparatively easy trails. But, according to elevation is the toughest day. Now, early morning after breakfast, you start your trek to Gorakshep for 3hrs over the wide trail from the mid of two rocky hills with the view of Khumbu glacier and mountains. As we reach Gorakshep, you left all your things in the lodge and have you another meal. 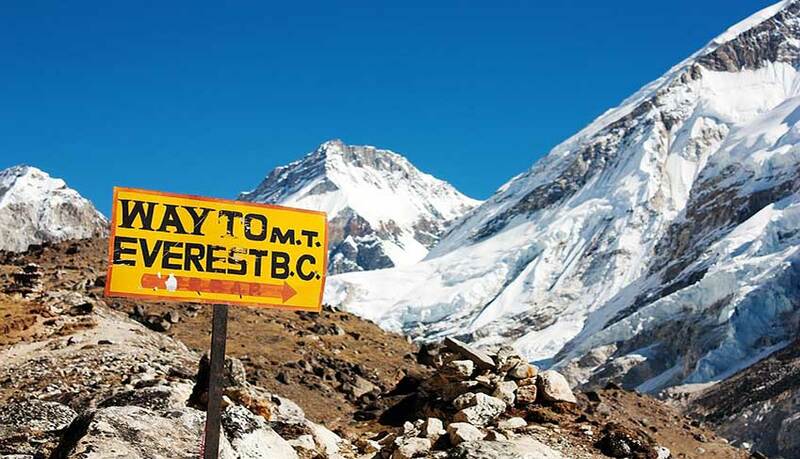 Afterward, you go to Everest Base Camp which will take five hours up and down. Rest a night at Gorakshep. The major highlights of the day are many mountains view along with top of the world Mt. Everest (8848 m) other include Mt. Nuptse (7861 m), Mt. Pumori (7138 m), Lingtren (6749 m) Tibet mountain called changtse (7543 m) etc. Rocky landscape, Awesome Khumbu glacier, Birds (Himalayan Ravan), if you stay silently Pica (A small mountain Rat). Everest Base Camp Trek – Gorakshep to Pheriche (4100 m, 6 hours). Early in the morning before breakfast at 5 am you will have a tea and hike upwards for 2 hrs to Kalapatthar (5550 m). From Kalapatthar, 360-degree of panoramic Mountains view along with Khumbu Glacier looks amazingly awesome. Actually, the Mount Everest, a top of the planet from the sea level look perfectly stunning which even you cannot expect that much great and impression like very close. The Even better view then EBC (Everest Base Camp). Another, after returning back from Kalapatthar have your breakfast around at 8 am and at 9 am moving from the lodge which is descending trek followed by the same trail and reach to a Lunch place at Lobuche. You feel very relieved and calm. After lunch, you just trek for 3hrs to Pheriche. Which lies in a valley, surrounded by rocky hills and mountains. But, the town is very much windy and better for summer settlement. The mountains that we see from here are Amadablam, Thamserku, Kangtega, Tabuche, Cholatse and Lobuche peak (6119 m). Everest Base Camp Trek – Pheriche to Kyanjuma (3440 m, 6 hours). Follow a different trail up to Syomare. After that, the trail leads efficiently down and uphill by crossing Iron Bridge. But, it will be descending trek. Because from 4250 m you descend to 3610 m. Which is more or less 600 m down. Again by following Dudh Koshi River you encounter the tree line and return back through the same trail by transit real village Pangboche and head through rhododendron and pine tree and stop at Tengboche for lunch. After that, over again your descent to fungki tenga. Cross the suspension bridge and head few minutes upwards by passing rhododendron and pine forest, you arrive at Kyangjuma. This is a perfect place to breathe in the mountain scenery. Here, you stop for an overnight stay. Everest Base Camp Trek - Kyanjuma to Monjo (2800 m, 5 hours). Today again the trail moves gradually downwards. As you follow by Dudh Koshi River, Mani stone, chorten, and stupa, you reach Namche Bazaar. Again follow same trail descending highly through rhododendron and blue pine conifer trees, by walking on Dudh Koshi river beach, crossing suspension bridges, and showing national park permit and TIMS, rounding clockwise prayer wheel, you reach Monjo. The best of Monjo is large rock territory along the trial that locally used for storage. Surrounding green nature and landscape makes you a finest for rest place. Everest Base Camp Trek – Monjo to Lukla (2900 m, 4 hrs.). Very soon basecamp experience going to end. Today, after your early breakfast all over again as we inclined through many mani stone, chorten and prayer wheel along with by enjoying the mountain and green view, crossing suspension bridge and gave a time to pass a mule train that are transported goods to remote part of the Everest region, and other facts of ridge trail, you grasped second time on the same place, Thado Koshi. After that, the trail lead downwards for few minutes and head up to the Lukla. Fly Lukla to Kathmandu (1350 m, 30 min). Fly back to Kathmandu airport and transfer to The Hotel. Flight back to your home country at any time or you can extend your adventure trip. For more info, Contact us. What’s Included In Everest Base Camp Trek? Transport: Plane (KTM-LUK-KTM), Jeep, car, coaches, and minibusses depending on the group size, and Walking/Hiking. What’s not Included In Everest Base Camp Trek? Expenses due to individual nature like shopping, tipping or tips, and so forth. Expenses due to unexpected circumstances like Emergency Fund, Entrance Fees. Expenses like the budget for drinks, cigarettes, laundry, the internet etc. Tipping or tips for Guide and Porters.